Last year when my garden was over-flowing with squash I made my family’s Greek Zucchini Moussaka. Layers of ground lamb, cheeses and fresh zucchini – and it was delicious. This year, I wanted to make another traditional recipe not seen here to often, but served in Greece all summer long. 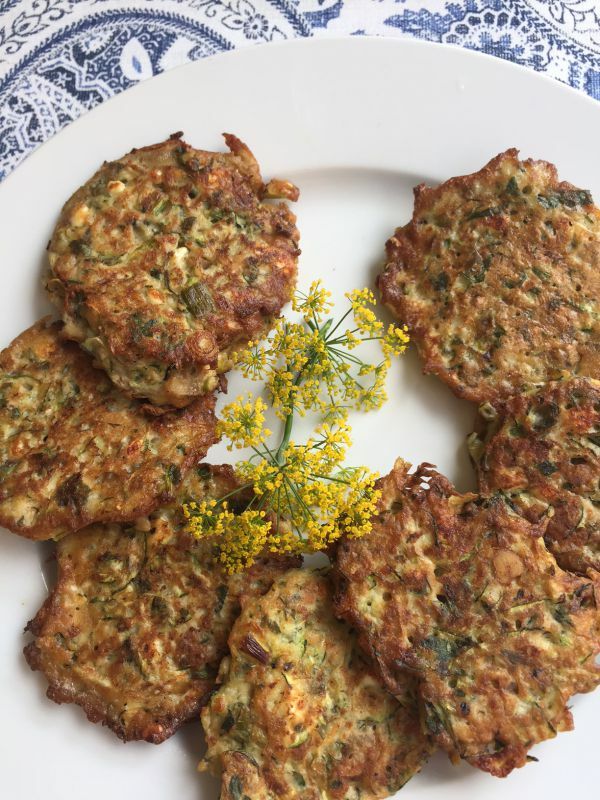 They are flat fried patties made from zucchini usually served with a Tzatziki Sauce. These are a staple in most Greek homes in the summer season. Make them as a quick breakfast, quick appetizer, simple lunch, or a side dish to any protein. Leave ample room for frying. Always made in the summertime in Greek homes this dish is served with a cool yogurt based sauce, called Tzatziki. For a new twist I used my quick red pepper sauce, which gives it a roasted spicy flavor. These can be served as a side dish, appetizer, or an easy late dinner. Grate the cucumbers in a colander. Let drain as you prep the other ingredients. 2. Dry the grated zucchini between two sheets of paper towels and squeeze out the water. 3. In a large bowl, combine scallions, eggs, flour, dill, parsley,feta, salt and walnuts. Add the salt and pepper to taste, keeping in mind the feta is salty. 4. In the skillet add enough olive oil to cover the bottom and heat to medium. Test the oil with the end of a wooden spoon until small bubbles arrive. Now, you are ready to fry. 5. With a soup spoon drop the zucchini carefully into the pan leaving room around each mound to cook. Cook until the bottom of the pancakes are brown and flip. This should take around 10 minutes. 6. Place on a paper towel plate and continue with the rest of the batch. 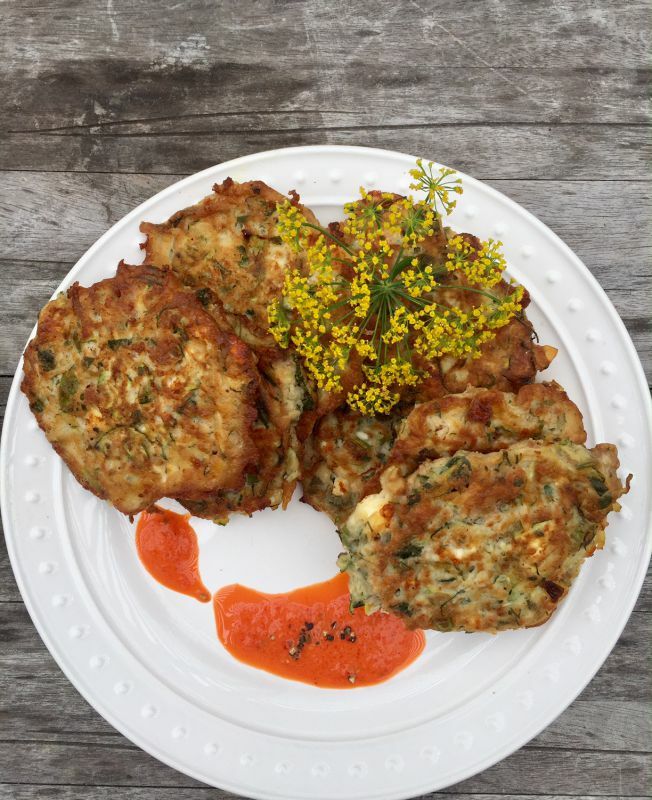 Serve warm with the red pepper sauce or Tzazikki sauce. 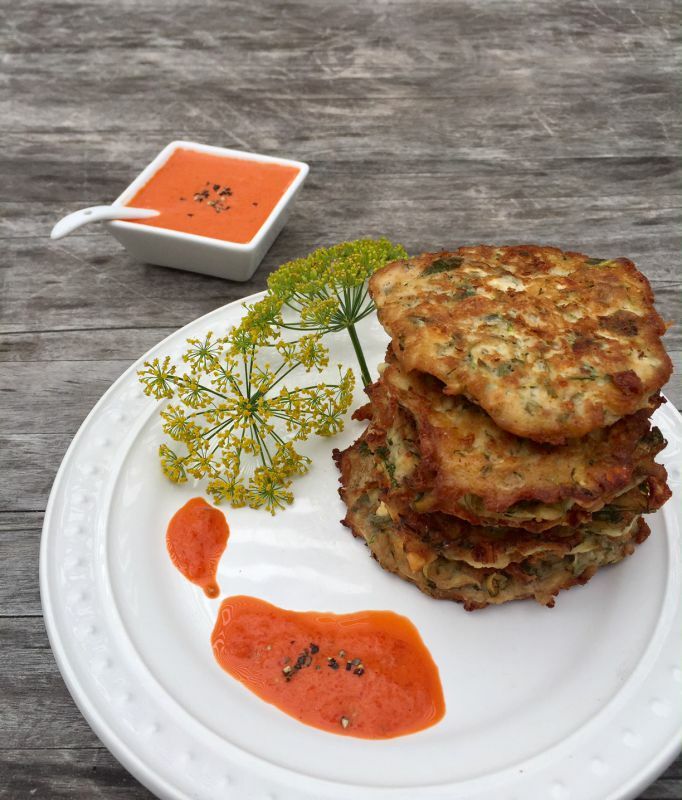 Even though this is these are great plain, this is the traditional sauce served with this recipe. Recipe for Mary’s Tzatziki Sauce can be found on my blog. 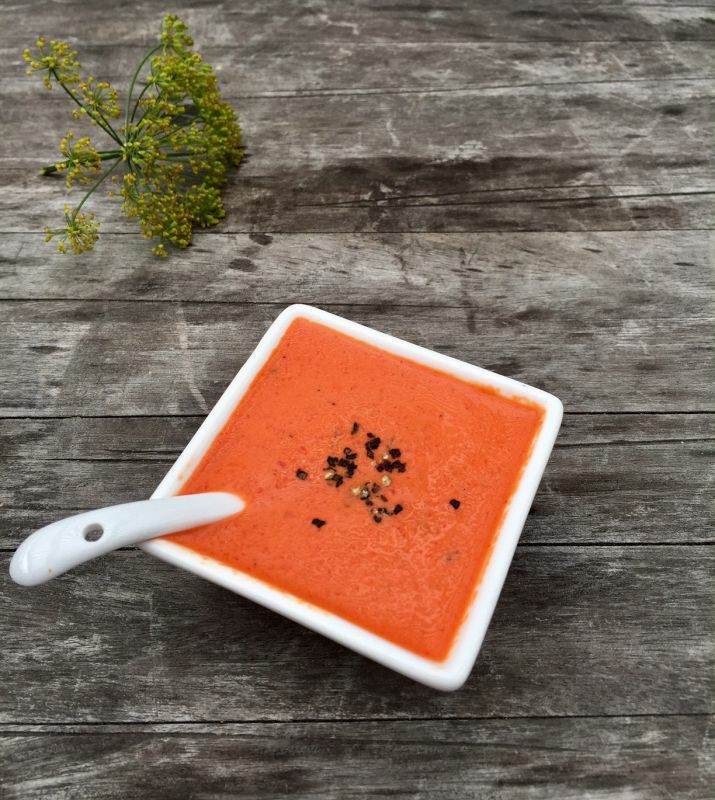 I chose to roasted flavor by making this Roasted Red Pepper sauce for a new twist. It’s your choice! Use this sauce for topping many dishes as we did here for the Zucchini Patties. You can also buy the red peppers roasted and ready to be used in this recipe. In a blender, add the peppers and blend. Slowly add the broth and continue to blend until smooth. You may need to add less or more broth until it reaches the pouring stage. Place blended peppers in a bowl and add the cream, salt and pepper to taste and stir until combined. Note: You can use a prepared medium jar/can of roasted red peppers for this recipe. Summer is all about gathering with friends and family! © 2017, Mary Papoulias-Platis. All rights reserved. Zucchini is such an abundant summer vegetable so it’s a good idea to get them fresh and local while you can! This looks delicious, and I love that you can really switch up the flavors depending on which sauce you use. This is a recipe you can make your own, using what you have in the kitchen!